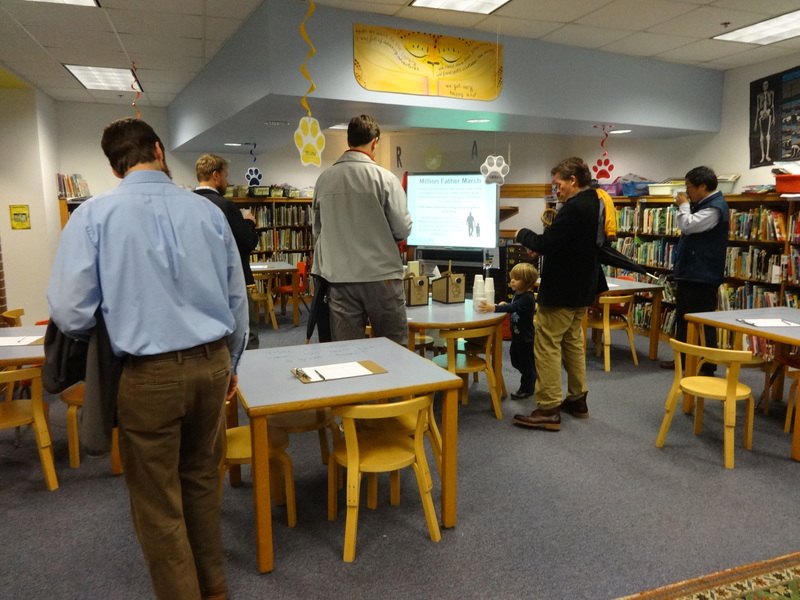 This morning, Dads took over Johnson Elementary School! 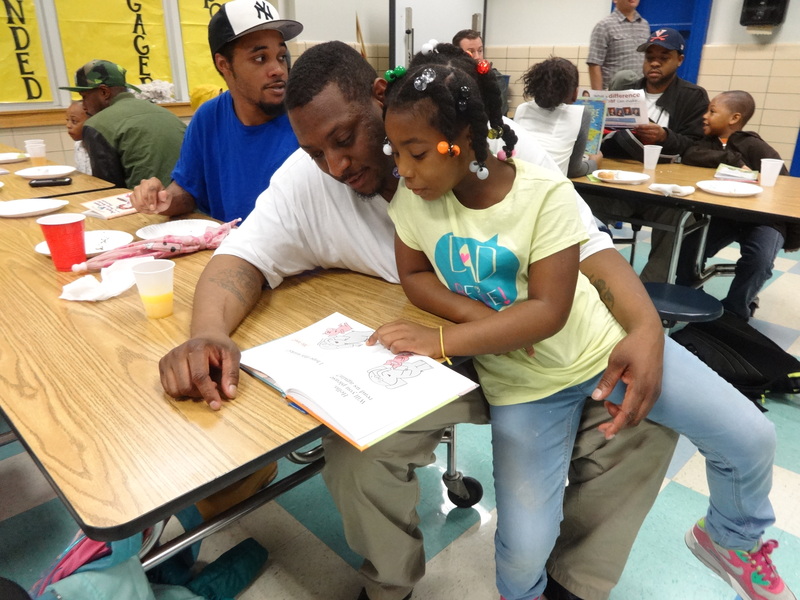 In one of my favorite reading events of the year, the Johnson Reading Team invited dads, uncles, grandfathers, cousins, and other special male figures to share breakfast and stories with their children in the cafeteria. I am always amazed at the number of participants we see at these events, even before 8 AM! 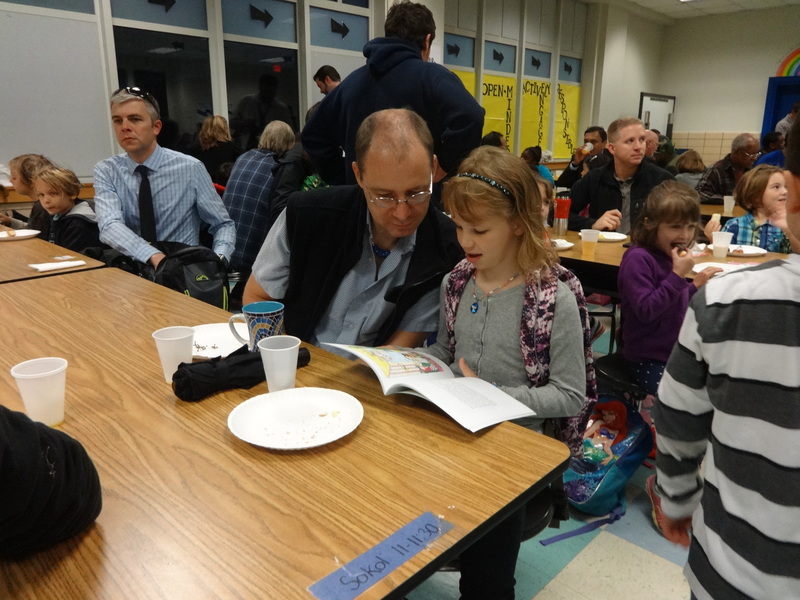 Students and their loved ones enjoyed donuts, fruit, juice, and a story or two. They even left with a free book! Johnson’s Reading Team does such a incredible job putting these events together and welcoming our students’ families. 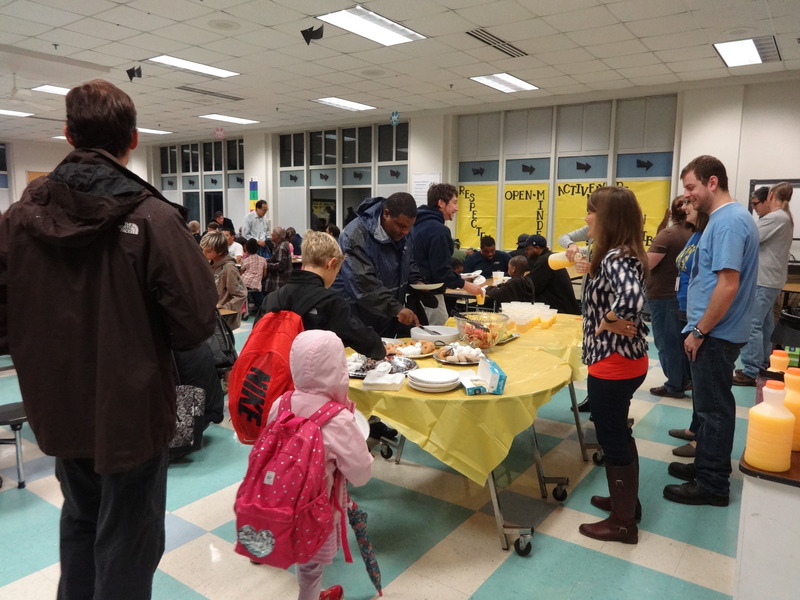 This year we had our biggest crowd ever – by 7:30, the cafeteria was at standing room only! It is wonderful to see the special relationships that Johnson students share with the male role models in their lives, and makes me especially proud to see these connections being built and maintained over stories. Books are the best way to connect, share, and start meaningful conversations. Even if they’re silly ones that you read while eating powdered sugar donuts! After Donuts for Dads wrapped up, I invited the visiting guys into the library to get involved in the Million Father March. 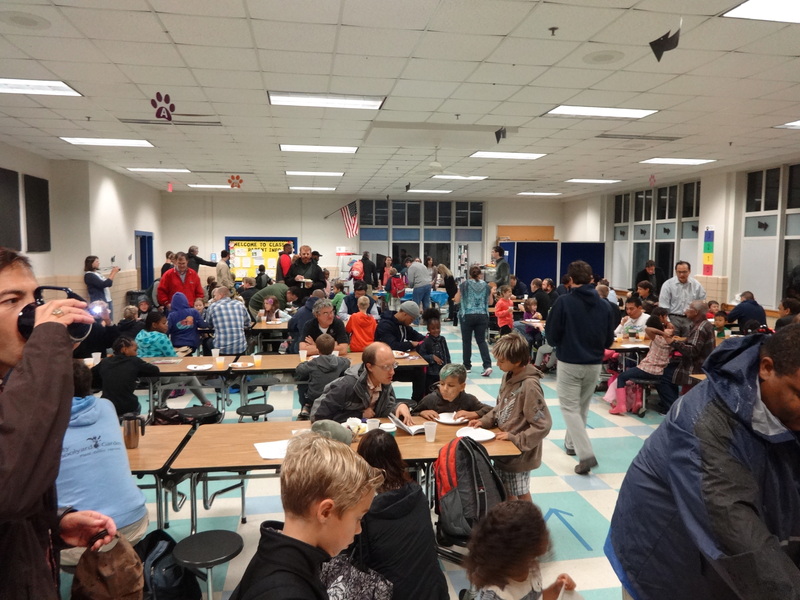 Dads were invited in to grab a cup of coffee, read about the Million Father March project, and browse volunteer opportunities available to them at Johnson. 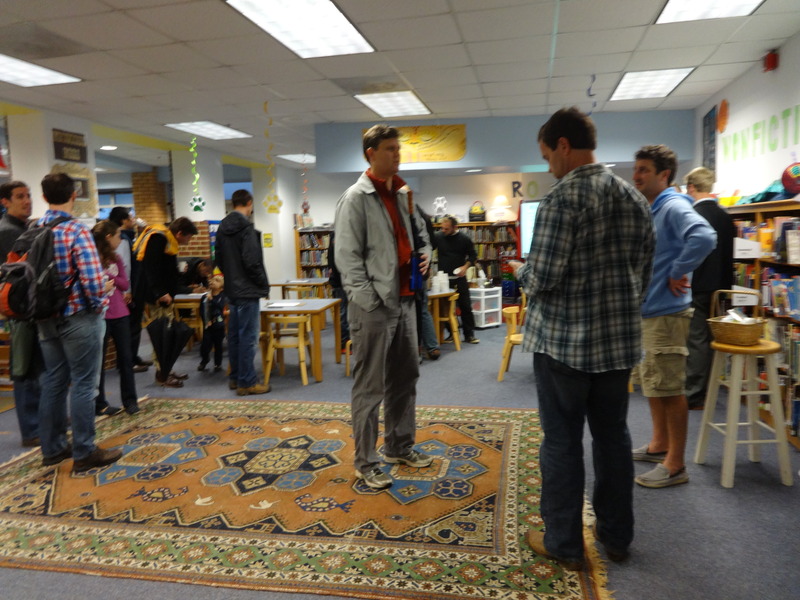 After polling Johnson teachers, I learned that volunteers would be the most useful in a few common places: the garden, cafeteria, and classroom, plus at recess and on field trips. 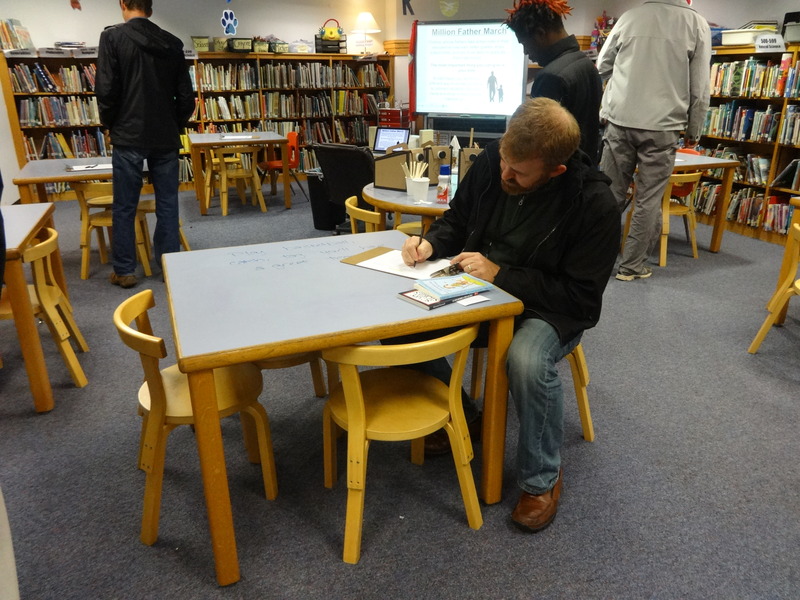 Each table had a sign up sheet for a different volunteering opportunity, and dads were invited to sign their name and info to each sheet that interested them. We ended our morning with 26 volunteer sign-ups – a great number for our first MFM event! I was so proud to see how many braved the early hour and the cold rain to donate their time to support their child’s education. Each dad brings a unique, important set of skills and support to the table for our kids. The most important thing that you can donate is your time! My hope is to expand the Million Father March group to get even more male role models into Johnson’s classrooms, cafeteria, and activities. Thanks for coming to join us, Dads. We hope to see you again soon! Learn more about the Million Father March and what inspired me to get involved here. Or hear the NPR piece that started it all. Calling all Dads for the Million Father March! 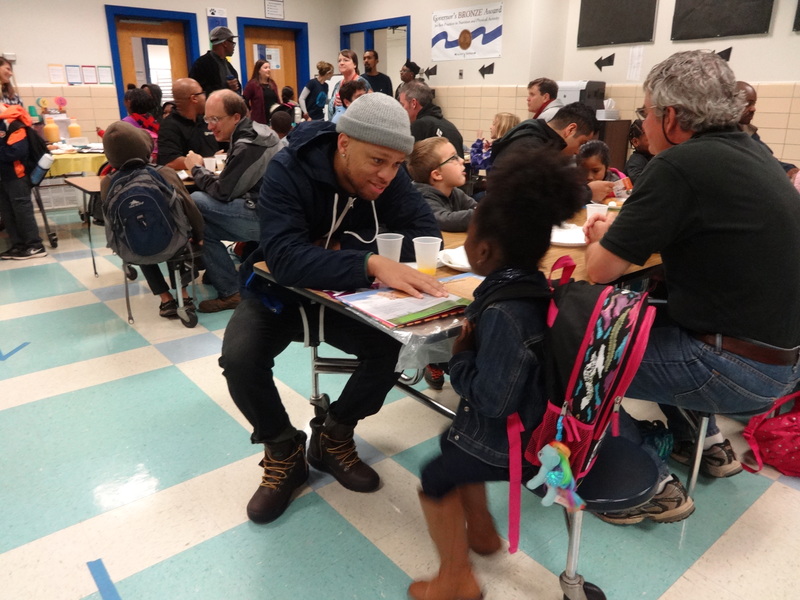 Research shows that children whose fathers take active roles in their educational lives earn better grades, enjoy school more, and are more likely to graduate from high school. Join us Friday after Donuts with Dads for Johnson’s first ever Million Father March event and show your support for our students! Stop by the library for a cup of coffee and to browse volunteer opportunities available to you at Johnson. The Million Father March is a great opportunity for male role models from all races, nationalities, and faiths to get involved and make a difference in their child’s education. Sign up to work in the garden, spend time in the classroom, chaperone a field trip, play basketball at recess, or work with the PTO to make Johnson a better place. Show your commitment to the educational lives of our students. Get involved and inspire them to work hard and achieve their dreams!